I just threw out most of the long agreeing-with-you rant I was going to post. 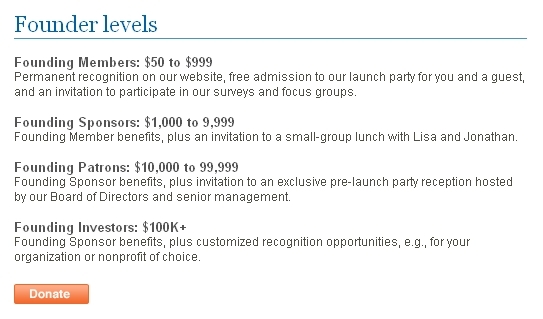 Except, the part about the “donate $1,000+ and get to lunch with us” REALLY bugs me. Reminiscent of those Washington Post influencer dinner invites that drew so much fire a few months back. Maybe we’re just not brazen enough to dare sending out letters requesting potentially huge sums of cash. Even though, unlike this enterprise (which we too hope grows and flourishes), we have a four-plus-year track record of growth and service. OMG, suggesting that a four-digit donation would buy a chance to lunch with co-publisher hubby and me? Cough. If you want to meet “readers” (we prefer “collaborators”) and other supporters, I think *you* should be buying *them* the food and drink. We’re not much for meetups, tweetups and happy hours (we are covering community-group meetings most nights), but one of these days we’re going to throw one whale of a party to celebrate all this fun we’ve been having, thanks to our wonderful community. And we wouldn’t dream of charging WSB peeps a dime. Personally, I was underwhelmed with the long editor’s note about the choosing of the name Bay Citizen. I don’t care what you call yourself. Tell me what you’re going to DO. Yes, we have a $5 million grant from the Hellman Family Foundation. That much is clear and readily known. We will need this kind of funding if we are to accomplish our ambitious mission of being a destination for insightful, quality news about the nine counties and 7 million people of the Bay Area. So why do we need to raise $50 here, $100 there from our members? Because we will not accomplish our mission if we don’t have broad support from our community – moral, yes, but also financial. In five years’ time, we expect to be over 50% funded by membership support from the Bay Area community. Warren’s generous seed funding is exactly that – money to help get us off the ground. We’ve gotten a hugely positive response to The Bay Citizen so far. It’s up to us to live up to the Bay Area community’s high expectations, and ultimately the community will determine how well we succeed. Wow, transparency is rough…right journalists?